Winter is coming; modify your gloves to work with your phone's touchscreen! Unless your gloves are made of human flesh, in which case oh my god, then you probably have to take them off when you need to make a call or launch an app on your fancy iPhone or myTouch. I tend to use my nose when it’s too cold to take off my gloves, but only when no one’s around. I suppose I could just sew in a couple strands of conductive thread, as described in this little project, but then… oh, wait. There’s no downside at all. Really, it’s as simple as picking up a spool of conductive thread, sewing a few loops, and tying it off. Do you think you can handle that? 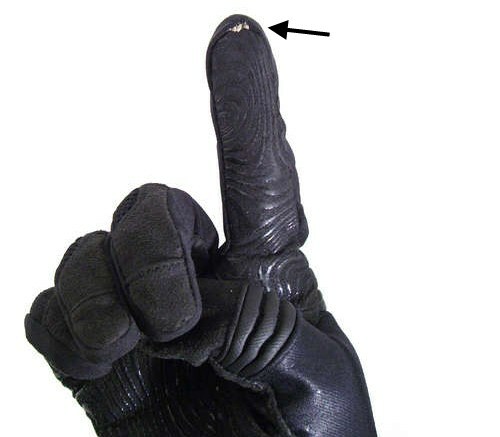 Now, conductive thread is pretty coarse, so you shouldn’t try this on your fine kid leather gloves, but any pair of cheap wool or cotton gloves should hold up just fine to a bit of poking.